I started to wonder: would it be possible for animal advocates to reach a major, yet underrepresented audience in animal protection circles (i.e. Republicans and conservatives) by reframing the anti-vivisection debate on fresh, pro-taxpayer terms? Put another way, it dawned on me that animal advocates could refocus the conventional arguments against animal experimentation (i.e. “it’s unethical,” “it’s junk science”) with a healthy dose of fiscal arguments (i.e. “it’s a waste of taxpayer money and a boon to big government”) to foster a new pro-animal coalition that appeals to the conservative’s natural distaste for wasteful government spending. For example, in 2010, 420 educational facilities received $11.5 billion of your tax dollars for a myriad of cruel, duplicative, and unnecessary animal experiments. Something is wrong with this picture. In the summer of 2009, Senators Tom Coburn and John McCain released a report entitled “Summertime Blues: 100 Stimulus Projects that Give Taxpayers the Blues.” One of these projects in particular caught my attention: the federal government awarded The Wake Forest University Baptist Medical Center $71,623 of our tax dollars to study the effects of cocaine on monkeys. 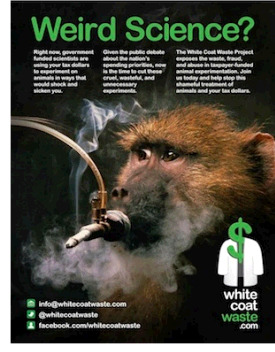 Why was the government using our tax dollars to study illegal, recreational drugs in primates? And what on Earth did this have to do with economic stimulus? The conservative community quickly took notice. During the 2010 midterm elections, Republican candidates such as Mike Prendegrast of Florida ran ads blasting Democrat Kathy Castor for wasting tax dollars on frivolous animal tests. Tea Party favorite Sharron Angle attacked Majority Leader Harry Reid for publicly supporting the experiments. As the story made inroads into the conservative blogosphere, I started to wonder: would it be possible for animal advocates to reach a major, yet underrepresented audience in animal protection circles (i.e. Republicans and conservatives) by reframing the anti-vivisection debate on fresh, pro-taxpayer terms? Put another way, it dawned on me that animal advocates could refocus the conventional arguments against animal experimentation (i.e. “it’s unethical,” “it’s junk science”) with a healthy dose of fiscal arguments (i.e. “it’s a waste of taxpayer money and a boon to big government”) to foster a new pro-animal coalition that appeals to the conservative’s natural distaste for wasteful government spending. To be clear: fiscal considerations have always been a part of the anti-vivisection arsenal – but out-of-control government spending has never dominated the public debate as it currently does. I’ve spent much of the last decade as a political consultant in center-right circles, specializing in issue advocacy for conservative causes. During that same period, I’ve also been very active in animal protection; I never saw animal advocacy as an inherently liberal issue (Matthew Sully’s landmark book, Dominion, should have killed that stereotype). But that doesn’t mean our movement can’t do a better job reaching out to conservatives of all stripes. It’s smart politics and it’s the right thing to do. There’s been some buzz in the movement about the “White Coat Waste Project” since HSUS’ annual Taking Action for Animals Conference. Several weeks ago, conference attendees were given a sneak peek inside the forthcoming “Project” and met some of our team members. As the project’s founder, and for those who couldn't make it to TAFA, I’d like to give you the inside scoop on the White Coat Waste Project - its genesis, its mission, and its objectives. The Project is made up of a diverse group of individuals with serious concerns regarding the level and intensity of taxpayer-funded animal experimentation. We share these three core values: we’re pro-taxpayer, we’re pro-transparency, and we’re pro-animal welfare. If you support any one – or all – of these values, then welcome aboard! We focus on cleaning up the government's waste by advocating for cuts in the most egregious taxpayer-funded animal experimentation. And we do it through a 3-step process: research and investigations (find the problem), advertising (expose the problem), and activation of a new coalition (solve the problem). The Project is unique in so far as our mission tackles extreme waste, fraud, and abuse only in government-funded animal experimentation. There are many animal protection groups, but nobody else is exclusively focused on cutting waste in the multi-billion dollar animal experimentation industry that is paid for with our tax dollars. We do not work on corporate and private sector issues involving lab animals. As a watchdog group, we’re focused like a laser beam on experiments being conducted on the taxpayer’s dime. In developing our strategy, we started with the current political climate. For those not in the Beltway, the debate isn’t whether to cut, it’s which program to chop; there isn’t much of an appetite these days for funding new programs. Traditionally, animal advocates advance the ball by pushing for new regulations, legislation, or programs to protect animals. And this has paid dividends; nobody can argue with the political success we’ve enjoyed in recent years. But our team reasoned that times have changed and that government is now a major force – if not the major force – sponsoring lab animal abuse. For example, in 2010, 420 educational facilities received $11.5 billion of your tax dollars for a myriad of cruel, duplicative, and unnecessary animal experiments. Something is wrong with this picture. Perhaps, then, in this gloomy economic climate, we could gain more mileage for animals by cutting harmful programs, rather than advocating for new pro-animal measures. In theory, this would also provide the bridge for building coalitions with new allies on the right, most notably fiscal conservatives. Taxpayer-funded animal research is rife with waste, fraud, and abuse hiding behind the cloak of science and supposed accountability. These experiments are an affront to fiscal responsibility, common sense, and limited government. Countless publicly-funded animal experimenters live off the big government gravy train while taxpayers foot the bill – all with very little to show for it except massive debt. If you support fiscal discipline, accountability in government, and integrity in science, then you must question taxpayer-funded animal experiments. If you think big government programs are inherently wasteful, inefficient, and incompetent, then you must question the astronomical spending on taxpayer-funded animal experiments. Finally, even if you agree with animal experimentation in principle, you have the right and responsibility to know what occurs behind the closed doors of the taxpayer-funded labs that you’re paying for with your tax dollars. I know of no other animal protection group that is explicitly geared toward center-right outreach, as our mission entails expanding the lab animal issue to include the federal government's accountability to the taxpayer. We have high hopes for the White Coat Waste Project. And we’re interested in what you think. Does the strategy seem sound to you? Please let us know. And if you would like to get involved in The Project, please email [email protected] or visit whitecoatwaste.com (full website coming soon) to register for email updates. Thanks! Anthony is a co-founding Director of HRC and a Vice President at Campaign Solutions/ Connell Donatelli, where he specializes in online fundraising and advertising for public affairs campaigns, ballot initiatives, and non-profit organizations. In 2010, he was honored by Campaigns & Elections Magazine as a “Rising Star of Politics.” Some of his animal protection clients include the Physicians Committee for Responsible Medicine, the American Anti-Vivisection Society, and the Fund for Animals. In 2007, he served as Executive Director of the American Association of Political Consultants. He holds a B.A. from the University of Pennsylvania (2000) and an M.A. from the George Washington University’s Graduate School of Political Management, with concentrations in corporate public affairs and campaign management (2005).